I'd never heard this expression until tonight, but it really does make sense. Provided, of course, that you have a hat in the first place. I suppose then that if you have no hat then you cannot call the place in which you live your home. Dinner this evening on per diem was TGI Friday's in Cerritos. Had me a Jack Daniels Flatiron Steak with fixin's. Quite unlike my sensory overload of a few nights ago, this was more my style. Then again, I knew what to expect, since I'd been to Fridays before in other parts. Not that it has any particular importance, but I kept my Guinness hat on as well as my jacket. Yet had I wanted to, I could have placed each on what I think is the coolest invention I'd ever seen. Up until then, anyway. There were folding sets of coat hooks on pretty much every vertical post in the place. Which of course, is interesting since it never rains in Southern California, nor does it get cold. Well, Utah cold anyway. So what point would there be in having so many coat hooks? It doesn't much matter - put enough coat hooks in a place and even I would wear a jacket just to use one. In fact, they've been around for at least a hundred years. 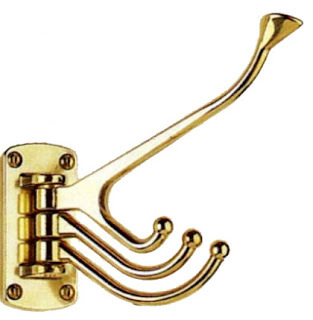 Here, for your viewing pleasure, is a picture of a Marine Four Way Coat Hook: From the 19th Century. So what if it's a reproduction. Coming in both brass and chrome plating, they're also available both with and without balls on the ends. I sense a project in the offing. Bobby, Bobby, Bobby ! You have never heard this expression? I know I am a little older that you, but geez, pull your head out. I always heard it as "Home is where you can scratch where it itches".